This is one of those cards that developed itself - it's nothing like what I started out to create! The size of the base card is 9.5" x 6.25" folded in half at 4.75". 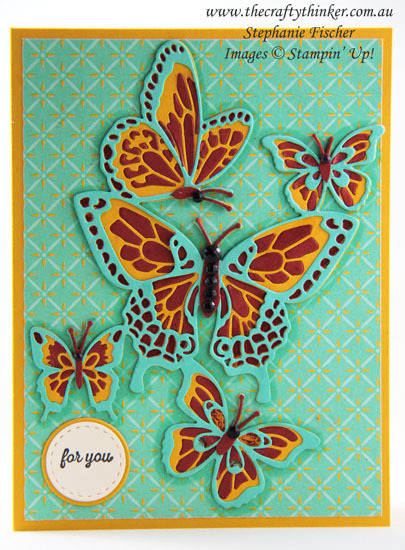 This larger than I normally make but allows for the size of the butterfly die-cuts. The base card is Crushed Curry to which I added a layer from the Tea Room Specialty Designer Series Paper. The greeting is from the Itty Bitty Greetings stamp set cut out with one of the dies in the Stitched Labels set layered onto a circle cut with the Layering Circles set. I then proceeded to cut the butterflies using the Butterfly Beauty Thinlits. I cut the "base layer" twice; once from Crushed Curry and once from Cajun Craze cardstock. The "top" layer I cut from Pool Party cardstock. I paper pieced the bottom two layers. This is not difficult - just a bit time consuming. Anyone who enjoys puzzles will enjoy paper-piecing. Then I placed the Pool Party layer on top. Finally, I fussy cut the bodies from the Cajun Craze piece and attached them to the top layer. I used a Cajun Craze Stampin' Write Marker to colour in some of the little details that I couldn't paper-piece. 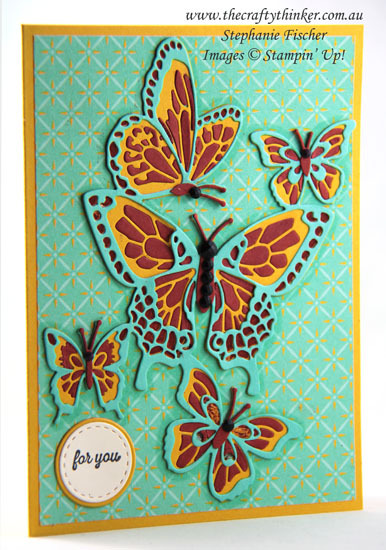 Having added some Faceted Dots, I used a Dark Pool Party Stampin' Blend alcohol marker to add a shadow around the edge of the butterflies. Using the Precision Base Plate in the Big Shot will provide a nice clean cut (I keep a rather mangled looking cutting pad to use exclusively with the Precision Plate which is very hard on the acrylic standard cutting pads). Once cut, I handle the die and paper very gently to try to keep everything in position. This makes it easier to identify pieces and where to glue them. The Paper-Piercing Tool is really useful for pushing out just the piece you want to glue. The Fine-Tip Glue Pen is a good tool for adding dots of glue where you need them with precision.